Hello, friends! Hope you're having a wonderful Easter week. Welcome to this week's Grace at Home party, where we celebrate all the ways we make our homes places of grace and beauty. Patti from Old Things New gave us a springtime tour of her lovely home. So much inspiration here! Handan from The Navage Patch showed us how to make these beautiful candles. 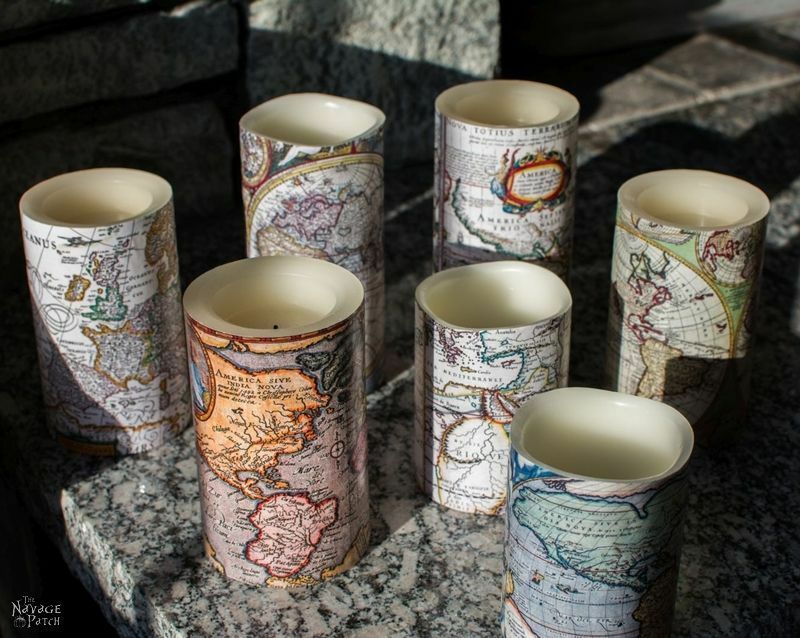 She created them from printable maps, LED pillar candles, and Mod Podge, and she gives excellent step-by-step instructions for making your own. 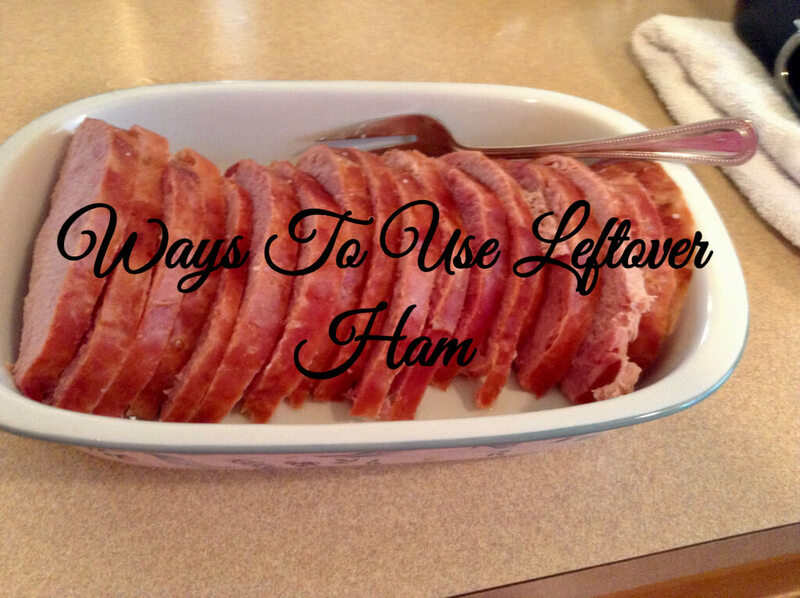 Marilyn from Marilyn's Treats shared 20 ways to use leftover ham. This is just in time for me, since I purchased a big ham for Easter dinner and we have a lot left over! Lil at Embracing the Lovely wrote of the need to be still before God and shared a beautiful printable. Visit her blog to download it for free! Hi Richella: thank you for hosting such a wonderful link up. And thank you for spotlighting the work of other bloggers. Those candles, that ham...it's all so lovely! Blessings to you! Hope your Easter was full of blessings. Thanks for hosting! Thank you so much for the lovely feature today Richella. I needed a pick me up so seeing your comment really brightened my day! Great features...thanks for hosting Richella...have a great week! 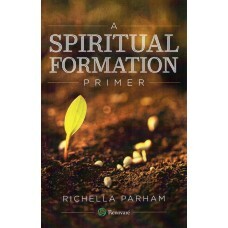 What a great choice in featuring Patti, Richella. 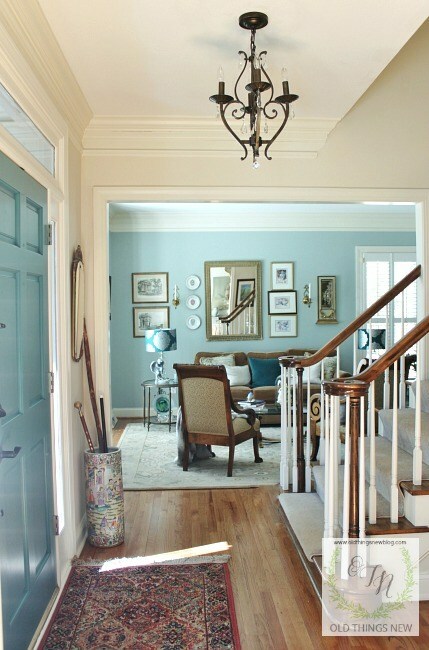 I'm smitten with her front door color and her pretty living room. She's always so inspiring. Thank you so much Richella, for featuring my Springtime decor. You are the best! Richella - I love that you featured my friend Patti and her springtime decor! Her home is just as beautiful in person as in pictures. I really loved the other 2 posts you chose to spotlight as well, especially since I have a lot of left over ham.... and I love maps and candles- 2 great combinations. Thanks for hosting. Thank you for featuring my Ham Roundup. Thank you for hosting. I appreciate all the work that goes into each party. Your feature picks this week were all awesome. I hope to see you at the next #Overthemoon on Sunday, #WonderfulWednesday or #ThursdayFavoriteThings. Have a lovely week. Hope you had a nice Easter, Richella. Thanks for the awesome party and have a great weekend!